“It never occurred to me what was to the north of me [Whitehawk]. Since I’ve been involved in the Bygones group, I’ve discovered a whole side of Brighton that I never knew existed and that side is much more interesting. The real nitty gritty, the harsh Brighton. I was shocked at the level of poverty. I was shocked at how very, very poor some people are. I don’t know anybody rich who lives in Brighton. Sue Craig interviewed by Julian 15th April 2006. The photo posted in the above article looks like the end of the Whitehawk Road. The pathway that is to the right must be the pathway that led to the allotments, that’s how I remember it from the 50s when we sometimes walked home from the school in Woodingdean. There was a kid I walked home with called Mickey Woolmer, he had a brother called Joey and another brother called Peter, and they lived quite near to where the photo was taken. The photo was taken from the top end of Whitehawk Avenue, looking down from where the Swanborough flats are now built. The turning on the right is the top end of Whitehawk Road. I lived in Whitehawk Avenue from 1961-1977, then a great place to grow up in. I lived with my brother David at 113 Whitehawk Avenue with five other siblings and our parents – it was very crowded. I have lots of memories, in particular the Bowley family and the Scott family. My sister and I, Pat & Chris Marshall then in 1955, we came from Richmond Buildings to Whitehawk Avenue to my Gran’s Mrs Turrell. It was real luxury to have a bathroom and a bedroom to ourselves, because where we lived in Richmond Buildings we had to go out in the backyard to the loo, and we had a bath once a week down in the basement in an old tin bath on the stone floors. There were five of us and we all used the same water. We were fostered by a Mrs Cooper who had a son Michael, and David & Freddie Perkins were fostered and we all had to sleep in the same room, but we were happy. I can’t remember ever being really hungry, we had to wear secondhand clothes and it was a real treat to have some sweets once a week, either gobstoppers or sherbert dab or aniseed balls. We had threepence a week each pocket money and we saved one penny and a halfpenny each week for Christmas. Christmas then was so special we really looked forward to it. We would hang our stocking up on the wooden mantlepiece and next morning we had an orange and some nuts and icing sugar mice, it was so exciting. Then we would go to Sunday School and come home and have our lovely Christmas dinner and play out in the street until dark. Hello, does any one recall the Brickley family who lived at 55 Whitehawk Road during the 1930s and 40s? They were a large family of approx 13 children who attended St John the Baptist School. I would like to know if any one recalls a person named Terry who lived and worked in Gardiner Street near to the Church Street end. He was a clock repairer and used the name of Terry’s of Brighton Limited on his clocks dials, the date would have been early 1900. Does anyone remember the Tyrrell family who lived at 96 Whitehawk Road during the 1920’s? My grandfather was called Henry and his wife was Elsie and they had nine children one of whom was my dad, George Henry Tyrrell, who was born there in 1923 and sadly died in Hull in 1963. Does anyone remember the Thomson family? There was the dad Jock, mum Queenie I think, and two sons Les and Don. They lived in Whitehawk Avenue during the forties and fifties when Les met my Mum. They moved to Bute Street, Kemptown. Does anyone remember me from 135 Whitehawk Avenue, or my best friend Gloria Colley? We both went to Whitehawk Infant, Junior and Secondary schools from about 1955-1966. We are trying to arrange a reunion so if you are interested please leave a message and I will respond. Any memories of the Rolf family living at 57 Wiston Road from 1963-1967? A Merry Christmas to all. Hi Jennifer. Yes! My brother Chris and I attended the Whitehawk Infant and Junior from 1963-1967. Merry Christmas to you. Hi. I lived at 122, Whitehawk Avenue with my Mum and Dad, Peter & Jean Day, and my thee Brothers: David, Michael (Micky) and Colin. I have got such brilliant memories and seeing some of the names has spured me on to comment here too. I used to play on and around the Whitehawk pitches and the twitten with Ann Scott, Janet Laycock, Hulya Hasan, Wendy Bowley – we used to play out for hours and hours without coming to any harm. Such fond memories. Thanks to the wonders of Facebook, I have just met up with the girls after approx. 40 years and was just one of the best nights ever for memories, and looking forward to many more. I also lived at 58, Whitehawk Avenue for a short while too. 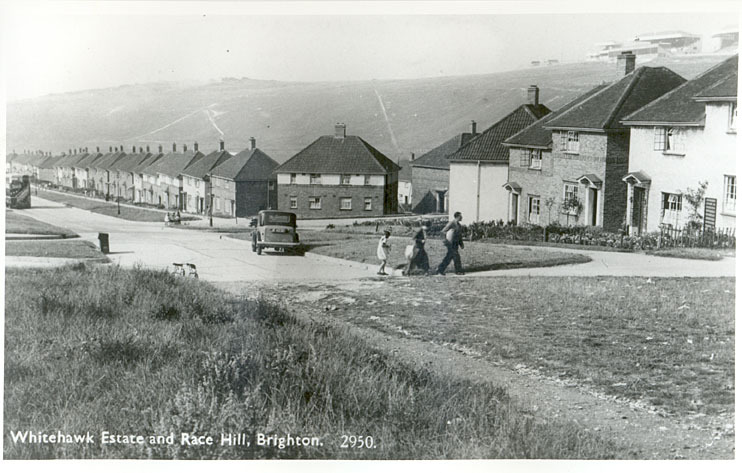 I lived in Whitehawk for almost twenty years (50s & 60s). OK we had little or no think to live on even though both my parents worked full time. But like most other people on the estate we live as one big happy family. I remember my school clothes being hand down to my brothers, being the eldest meant I had them new. There was some crime on the estate but nothing like the stories I now read about. My father was the group scout master on the estate for many years. Yes the house where cold in the winter, only a open fire in the living room to heat all the house. I can remember waking any a winter morning to find ice inside the bedroom windows and frost on my bed. In those days you were glad to get to school so you could get warm. Pauline Godden, I hope you and your family are all well. I do remember when Tony and Steve went missing, my mum was close to a nervous breakdown! I have such fond memories of those days. I have recently met up with some of the girls from Whitehawk and we had a great time remembering all the carefree happy days we had, we laughed the whole time. I am loving this site and enjoy seeing some names from the past.